Elizabeth Taylor grew from a doll-faced child starlet to become one of the silver screen's most striking beauties, not to mention a compelling actress and one of the world's most famous movie stars. She has been a natural magnet for publicity throughout her life and is one of the most photographed women in history. She even holds the record for the most appearances on the cover of Life Magazine (11). But lest her fame and notoriety overshadow her accomplishments, it is worth remembering that Taylor has received five Best Actresses nominations and two Oscar statuettes over the course of her amazing six-decade career. 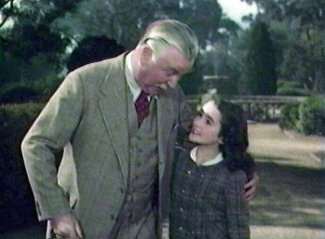 After an inauspicious film debut as a bit player in Universal's THERE'S ONE BORN EVERY MINUTE (1942) (after which her contract was not renewed), ten-year-old Elizabeth Taylor was cast as Nigel Bruce's granddaughter Pricilla (at left with Bruce) in MGM's first Lassie picture, LASSIE COME HOME (1943), starring a collie named Pal as the title character along side child star Roddy McDowall. 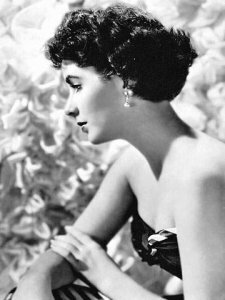 An acting novice, young Elizabeth managed to hold her own in the midst of such screen veterans as Donald Crisp, Dame May Whitty and Elsa Lanchester, and with the help of her striking good looks and favorable notices from critics, was launched on her way to stardom. Another minor role but one that was well received, Elizabeth was loaned out to 20th Century-Fox to play Peggy Ann Garner's young friend Helen Burns in the "Young Jane" sequences of JANE EYRE (1944) -- another picture filled with screen veterans, including Joan Fontaine, Orson Welles, Agnes Moorehead, Sara Allgood, and fellow MGM child star Margaret O'Brien. 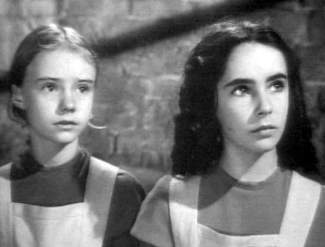 Back at MGM and in Technicolor, a twelve-year-old Elizabeth Taylor managed a miraculous growth spurt to win the role of Velvet Brown, a young English girl in love with a horse, in NATIONAL VELVET (1944). 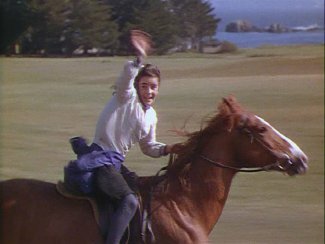 A riding veteran from the age of four, Taylor did her own riding for the film and most of her own stunts, as evidenced by the still at left. Taylor's natural girlish enthusiasm and love of horses showed through in Velvet Brown, bringing to life an enchanting and spirited character. 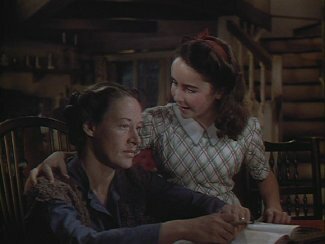 One of the most popular films of 1945, NATIONAL VELVET also featured a host of fine supporting performances, including those by Mickey Rooney, Donald Crisp and Anne Revere (right) who won an Oscar for her portrayal of Velvet's mother.